The Department of International Development would like to congratulate its trio of Professorial runners on a set of magnificent achievements. Professor Jude Howell completed the Brighton Marathon on Sunday 12th April. Her run, in aid of Breast Cancer Care, took just under six hours in blazing sunshine on the south coast. Professor Tim Allen then completed his tenth consecutive London Marathon on Sunday in aid of the Anthony Nolan trust. Tim has run the 26-mile course every year since 2006 following his recovery from a near-fatal strain of acute myeloid leukaemia in 2000. For those who aren’t aware, Tim spent an entire year in an isolation room at University College Hospital, and owes his life to a bone marrow donor found by the Anthony Nolan trust, which runs a marrow register. Last, but by no means least, the indefatigable Robert Wade shot to victory in his age category in the Regent’s Park 10K course held on 5th April. Robert, a regular runner and fitness guru around the department, finished the three-lap course in 54 minutes. 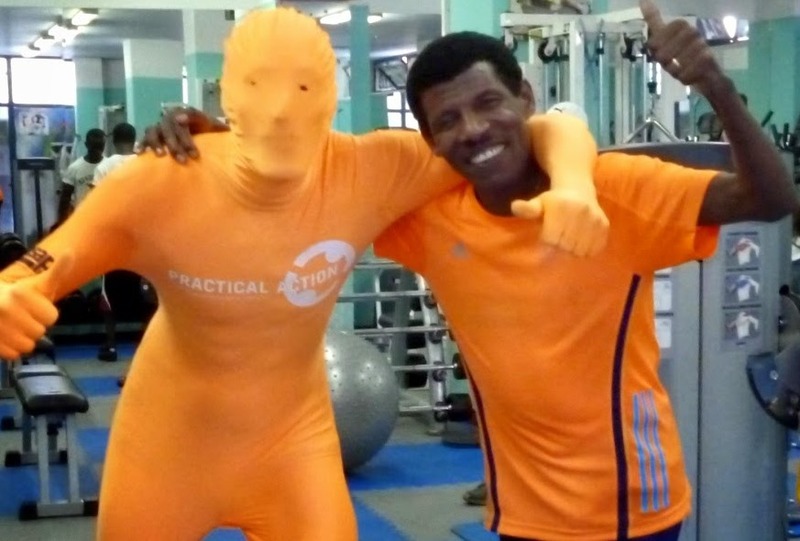 Destin alumnus Edward Stevens as Practical Action Man, championed by Haile Gebreselassie. We’ve also learnt that former DESTIN alumnus Edward Stevens made an attempt to break the Guinness World Record last week for the fastest marathon in a zentai suit. Running as ‘Practical Action Man’, and donning a skin-tight morph suit, Ed was hoping to break the 2 hr 48 minute record for the new category established only weeks before the race. In the build up, he gained the support of running legends Mo Farah and Haile Gebreselassie (pictured, above). Affected by illness, Ed completed the route in a laudable 3 hrs 19 mins, after looking on course to challenge the existing record until the 18-mile mark. However, having raised almost £3,000 for Practical Action, an organisation that works with poor communities to improve their wellbeing, he is determined to try again next year and push for the record again. Congratulations to all our runners, past and present!